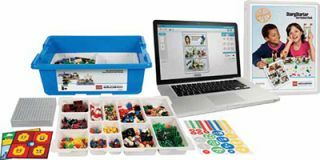 Designed for use in second through fifth grades, LEGO Education StoryStarter is a handson learning tool that enhances students’ reading, writing, speaking, and listening skills. One set contains enough elements to equip up to five students with everything they need to start constructing their own stories. Quality and Effectiveness: Have LEGO bricks ever been cooler? The classic building toy can now be part of everyday classroom work and can even be tied to standards, thanks to the StoryStarter curriculum packages. The lesson plans, objectives, and rubrics are meant to guide teachers toward building physical, mental, and digital literacies, all while having fun. While not the perfect solution, StoryStarter comes close to fulfilling the promise of gamification. Ease of Use: You’d be hard pressed to find a kid who is not comfortable with LEGO. The challenge comes with the additional element of working with StoryStarter. Students are led into conversation about creating characters and scenes and plots. They then create scenes using the specialized LEGO pieces. Here’s where it gets tricky. Using a Web cam, digital camera, or smart device, students can then take images of their creations and import them into the software or application. Students then turn into desktop publishers—using a variety of graphic design tools, they are charged with creating dialogue, editing images, and learning basic layout design. While this product is marketed for grades 2-5, we found our fifth-grade reviewer more inclined to use the software, with the second grader more intent on just building with LEGO bricks. Of course, we can’t deny what most parents and teachers would describe as the “Lego Factor”—hundreds, if not thousands, of tiny plastic pieces that will inevitably find the floor. The Core set does come with a tub designed to store the various pieces but our reviewers never seemed to get a handle on this concept. Suitability for Use in a School Environment: How effective these projects could be depends heavily upon class size and access to technology. LEGO bricks are great but messy. And keeping students on task could be a real challenge. The lesson plans and rubrics are descriptive and solid. As long as the teacher has a good grasp on multimedia skills and a keen imagination, StoryStarter should be a great addition to a classroom. • The huge popularity of Lego makes it an obvious draw for students to engage with in class. • The software tools are simple and intuitive, making the bridge between physical and digital play seamless. • The curriculum materials are well written and easy to follow.